This year, the first week of September is not a good week for sowing seed as germination is likely to be poor. This is a good time to do some weeding before hot weather sets in. Nights can still be chilly this month. Keep an eye on seedlings and provide delicate species with a warm, sheltered spot before planting out when nights are warmer. For gardeners in Temperate climate zones: if temperatures overall in your area have been warmer than usual, you may find the Warm climate planting guide more suitable from mid September, while areas experiencing colder than usual weather would be wise to follow the Cool climate guide until overnight weather is warmer. 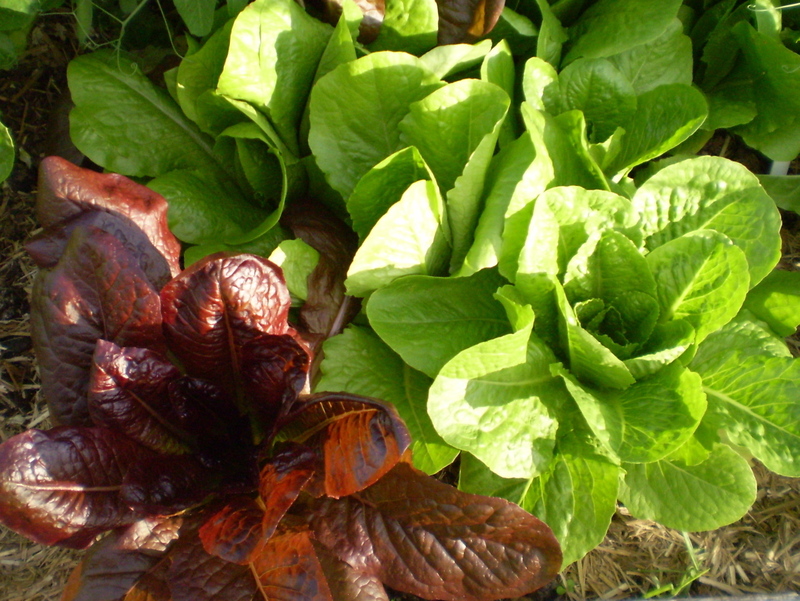 Lettuce plants love this mild weather. Keep them well-watered to avoid them developing a bitter taste or running to seed, prematurely. 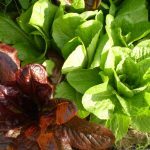 The following gardening advice of what to grow in September is an abbreviated list for vegetables, fruit trees and some culinary herbs that can be planted in August in Australia and New Zealand. A comprehensive monthly guide that includes planting times for the entire garden, as well as when to fertilise, prune, weed, take cuttings or divide plants, can be found in my book Easy Organic Gardening and Moon Planting (Scribe Publications, 2006, 2009 and 2012 with moon planting 2017–2022) – now also available as an e-book. For gardeners who do not use moon planting: sow or plant out any of the following list at any time this month, although you may find germination rates are lower when the Moon is in Last Quarter phase. Before the Full Moon, suitable grain crops, lettuce, mizuna, rocket, silver beet, NZ spinach, tatsoi, nasturtium and sunflower can be sown directly into beds, as well as a green manure crop of pigeon pea, millet, Japanese millet or mung bean, if water is available. Cabbage, suitable open-headed Chinese cabbage, parsley, spring onions and sweet basil can be sown or planted out. During First Quarter phase, bush and climbing beans, pumpkin and sweet corn can be sown directly into beds, and capsicum, cucumber, eggplant, rockmelon, rosella, summer squash, tomato, watermelon and zucchini can be sown or planted out. During Full Moon phase, Jerusalem artichoke, beetroot, carrot, potato (Brisbane and areas south), radish and sweet potato can be sown directly into beds, and asparagus seed, banana passionfruit, passionfruit, pawpaw, and chives can be sown or planted out. Avocado, banana, citrus, tropical and cherry guava, macadamia, passionfruits, marjoram, mint, oregano, sage, and thyme can be planted. Before the Full Moon, suitable cabbage, suitable lettuce, silver beet and NZ spinach can be sown directly into beds, as well as a green manure crop of pigeon pea, lablab or millet. Parsley, spring onions and sweet basil can be sown or planted out. During First Quarter phase, bush and climbing beans sweet corn can be sown directly into beds, and capsicum, cucumber, eggplant, rosella and watermelon can be sown or planted out. During Full Moon phase, beetroot, carrot, radish and sweet potato can be sown directly into beds, and banana passionfruit, passionfruit and pawpaw can be sown or planted out. Avocado, banana, citrus, tropical guava, macadamia, passionfruits, lemongrass and mint can be planted. Also plant marjoram, oregano, sage and thyme where they won’t become waterlogged. Before the Full Moon, suitable Chinese cabbage, grain crops, lettuce, mizuna, rocket, and tatsoi can be sown directly into beds, as well as a green manure crop of chickpea, clover, barley or millet. Celery, leek, lettuce, silver beet and spring onions can be sown or planted out. Cabbage, parsley and sweet basil can be sown in a cold frame, and NZ spinach, coriander and dill sown direct after frost. During First Quarter phase, bush and climbing beans, and sweet corn can be sown directly into beds, in frost-free areas. Capsicum, cucumber, eggplant, pumpkin, rockmelon, tomato, summer squash, watermelon and zucchini can be sown in a cold frame. During Full Moon phase, Jerusalem artichoke, carrot, potato and radish can be sown directly into beds, and asparagus seed, beetroot, sweet potato and chives can be sown in a cold frame. In frost-free areas, banana passionfruit, passionfruit and tropical guava can be planted. After frost, avocado, blueberry, citrus, cherry guava, macadamia, olive, marjoram, oregano, sage, rosemary, French tarragon, thyme and evergreen trees, shrubs and vines can also be planted. Cool climate gardeners may still need a cloche to protect young seedlings. Before the Full Moon, grain crops, lettuce, radicchio and rocket can be sown directly into beds, as well as a green manure crop of clover, broad beans, field pea, barley, oats, triticale or wheat. Cabbage, celery, bulb fennel, leek, silver beet and spring onions can be sown in a cold frame. In very cold areas, broad beans, peas and spinach can also be sown. During First Quarter phase, capsicum, cucumber, leek, suitable pumpkin, suitable rockmelon, summer squash, tomato, watermelon and zucchini can be sown in a cold frame, or after frost. During Full Moon phase, Jerusalem artichoke, carrot, potato and radish can be sown directly into beds. Asparagus seed and globe artichoke can be sown in a cold frame. After frost, potted grapes and evergreen trees, shrubs and vines can be planted, and turf can be laid. This entry was posted in Fruits and Vegetables, Herbs, Moon Planting diary and tagged Aussie gardening, Australian organic gardening, backyard vegetables, climate change gardening, cuttings, easy gardening, easy organic gardening, environmentally friendly gardening, first quarter moon, flowers, fruit, full moon, garden soil, gardening advice, growing plants, growing vegetables, Healthy soil, Herbs, how to grow, last quarter, lunar cycle, lunar month, moon phases, Moon Planting diary, new moon, New Zealand, organic fertilisers, organic gardening, planting by the moon, plants, propagating, September, sustainable gardening, synodic period, vegetables, weeds, what to grow, when to sow. Bookmark the permalink. Hi. Newbie gardener. What can I do for mildew on squash leaves?